Fresh extracts of organic Aamla, Bhibitaki and Haritaki along with the regenerating and conditioning properties of Henna, Shikakai and Bala blended into a natural protein base prevents damage & premature hair loss, leaving your hair clean and naturally soft. Additional Information : SoulTree works on the idea of bringing nature's goodness with honesty and responsibility. SoulTree makes Organic Ayurvedic Cosmetics from the finest of ingredients for a beauty that's natural, safe and free from any harsh chemicals. SoulTree products are certified Natural by BDIH, Germany, a globally renowned certification body. Their products are free from any petroleum based products or harsh chemicals such as SLS/SLES, silicones, parabens, DEA/TEA, phenoxyethanols, artificial fragrances. Explore the entire range of Shampoo available on Nykaa. 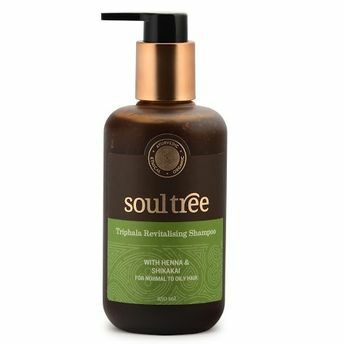 Shop more SoulTree products here.You can browse through the complete world of SoulTree Shampoo .